Get your free printable recipe for unleavened bread traditionally used in some Biblical Holy Days festivities. Unleavened bread is best know for it's use at The Feast of Unleavened Bread (Pesah) which is one of the first three compulsory pilgrimage feasts, traditionally a week long observance which involves men travelling to the Sanctuary in Jerusalem to present themselves before the Lord. (Exo 23:14,17, Exo 34:22, Deut 16:16). This is considered a convocation observance and is considered as a Sabbath day which means there is no work to be done during this Holy time. Preheat the oven to 350 degree and grease a cookie sheet. Use a coffee grinder/food processor/or cut finely with a knife to crush the cilantro and mix it with the salt. Add the oil to flour and mix well. Pour the water into the flour mixture and knead lightly. It will be ready when the dough is no longer sticky. Add extra water one teaspoon at a time if the dough is to dry. Use rolling pin to roll the unleavened bread dough out on a lightly floured surface. Flatten the dough to about 1/2 inch in thickness. Try to make the shape as close as possible to the shape of the pre-greased cookie sheet. Cut dough into triangles or squares. Unleavened bread is traditionally used in festivals and Holy rituals in the Holy Bible such as The Feast of unleavened bread (Pesah). 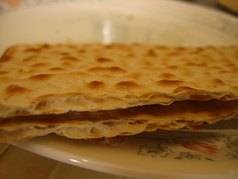 The Holy Bible specifically notes that the Festival of Unleavened Bread was to be observed by the Lord's people ​forever as per His divine instructions and even more important is the fact that the Lord says that whoever eats the leavened bread during this sacred period will be cut off from the congregation of Israel (God's Chosen).The celebration is an observance to remind us that the Lord brought His people out of Egypt and He specifically tells us to continue this tradition or be cut-off.